Carly Manso dribbles with the ball on Friday. Ohio lost to Buffalo in double overtime, 1-0, on Sunday. Photo by Carl Fonticella. The Ohio Bobcats fell to the Buffalo Bulls in double overtime, 1-0, on Sunday afternoon at Chessa Field. Buffalo’s (6-2-1, 2-0-0 MAC) game-winning goal came in the 109th minute during the second overtime period. Senior forward Katie Roberts recorded her fourth goal of the season when she found the ball in the penalty box, turned and took a shot at goal. 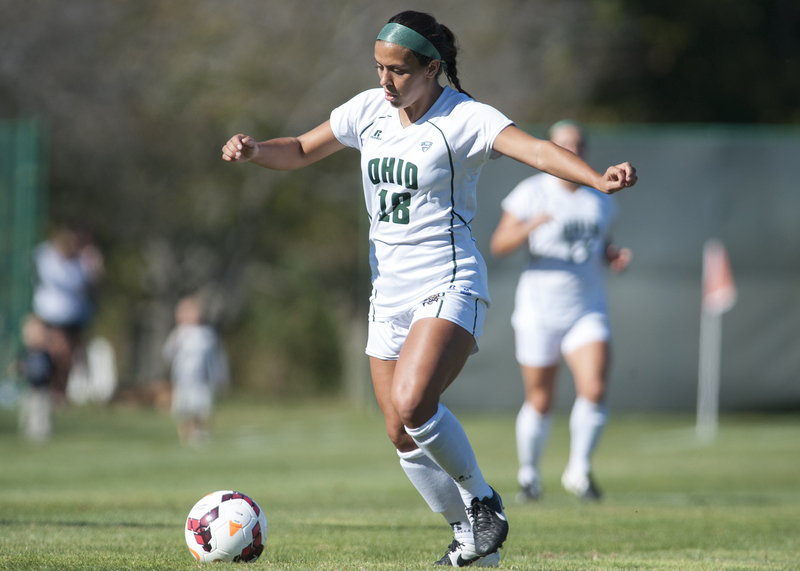 Ohio (4-6-0, 1-1-0 MAC) had a chance to win it in overtime with a shot from redshirt sophomore Carly Manso. Manso took a shot from outside the penalty box but the shot was saved by Buffalo’s goalkeeper Laura Dougall. “We got into attacking situations that were pretty good, but we need to be a little more clinical and finish those,” Ohio coach Aaron Rodgers said. Ohio faces Western Michigan in Kalamazoo, Michigan, on Friday before playing Northern Illinois on Sunday in DeKalb, Illinois.